SCVHistory.com LW2990 | Canyon Country | Hoopers Restaurant, Solemint Junction: Matchbook Cover ~1960s. 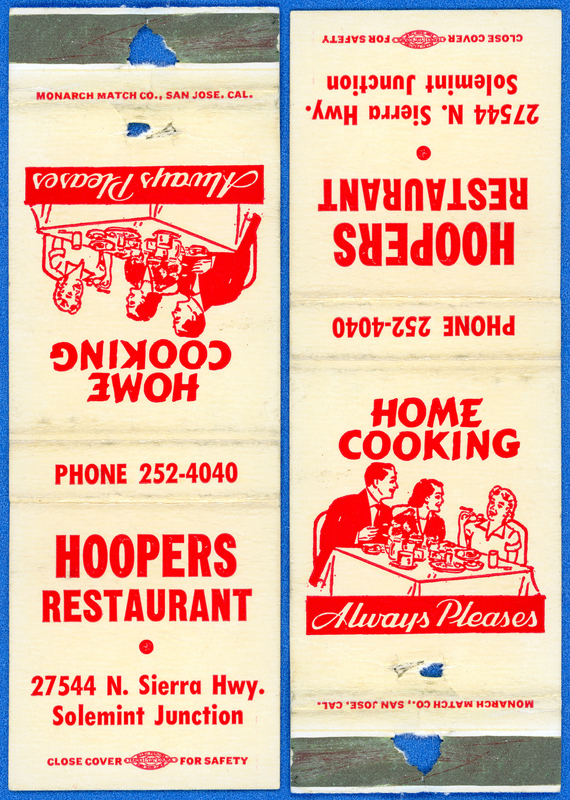 Matchbook cover from Hoopers Restaurant, 27544 N. Sierra Highway (southeast corner of Sierra and Soledad Canyon Road, i.e., Solemint Junction). We don't know when this restaurant was started or by whom, but it was there in the late 1960s. Matchbook probably dates to 1960s or early 1970s; the Newhall area didn't get direct-dial telephone service until 1960. LW2990: 9600 dpi jpeg from original matchbook cover purchased 2017 by Leon Worden.